• Sandusky can see most of his grandchildren at home, provided a parent is present. He can also have contact with most of his grandchildren via computer. There is a custody battle involving three of his grandchildren, and whether Sandusky can contact those grandchildren is in the hands of another judge. • Adult visitors may also come to Sandusky's home, though he must provide a list of 12 non-family members he intends to have over, and there are additional conditions. • Sandusky can travel to help assist his defense team, though authorities must be given 36 hours' notice and a precise itinerary of his plans. • Sandusky can go onto his back porch, from which he likes to throw biscuits to his dog. This despite neighbors' complaints that he had been watching children from a nearby elementary school from there. • Sandusky's request to have the transcripts of all grand jury witness testimony released was denied, but only because Cleland said the judge who had oversight of the grand jury could authorize that. 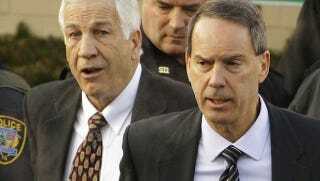 • The jury for Sandusky's upcoming trial will come from Centre County. Prosecutors had asked to have them come from somewhere else because, well, everyone in Centre County seems to have a connection to Penn State and The Second Mile, including some Centre County judges.